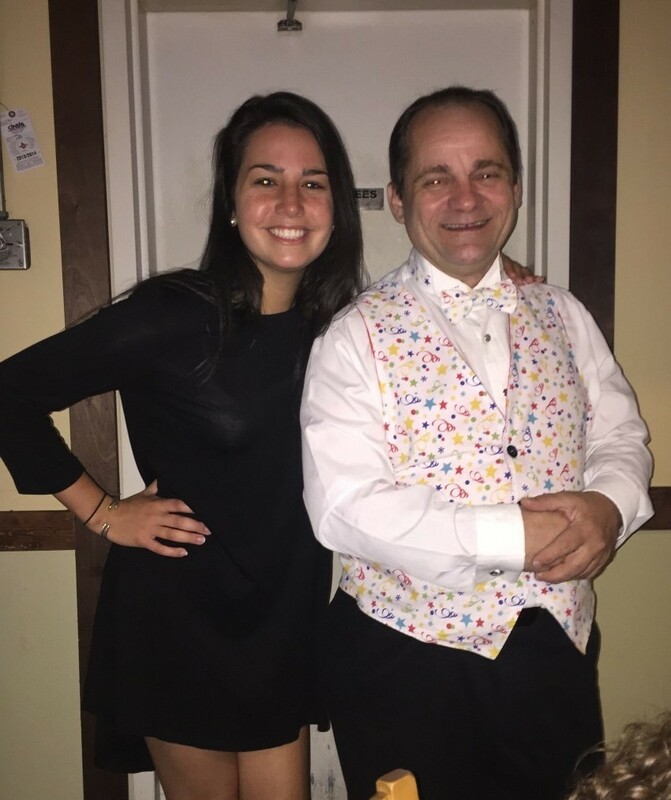 Jim The magic Guy at a birthday in NH? Halloween parties are fun with a balloon twister! Jim The Balloon Guy. Also avail. in a white vest with colorful balloons adorning it. During a Chistmas Show, Jimmy D. Elff is surprised when this young lady runs up and kisses his cheek / hugs him....and no one knows why? One moment there is tissue being ripped & torn and the next a Cool Hat appears! Award Winning Family Entertainer..Like to laugh & be amused? This warm/friendly Comedy Magician,Clown,Balloon Twister w/a dynamic,energetic personality is the One for You! Serv. family audiences 27 yrs-2017. Fairs,festivals,promotions,fundraisers,(link hidden)rties,kids birthdays,more! Fun & silly balloon twister-comedy magician, even with no makeup kids/adults still call me a clown ... it comes from Within. (link hidden)UST YOUR EVENT to a seasoned pro. "I Travel up to 75 miles". Book Now! JIM THE MAGIC GUY*JIM THE BALLOON GUY*EASTER BUNNY (not the big head type. see pics)*JIMMY D. ELF. Done w/ 45 reviews? (Gig Salad Verifies ALL REVIEWS) Check out 37 more Click "Testimonials" grey button below. I saw all the adults either laughing or smiling or both! Thanks so much Cindy and family. ..... it was a blast! We enjoyed having Jim at our event during our church's community Fun Day. We hired Jim as a balloon twister. He was very entertaining and created some great designs for our children (and adults)! He performed for us for two hours and he didn't stop once! He stayed busy the entire time. Everyone had a good time! If you want someone who is professional and talented, you should hire Jim for your next event! It was an honor being of service to your church in SC! I have entertained for Congregationalists, Unity, Universalist, UCC, Presbyterians, Christian Union, Lutherans, Catholics and I believe you are my 2nd Methodist Church! Thank You so much Donna Van Vleet! The Children had a great time , lots of smiles from the adults, nice to have a clean fun show without worrying about the content. P.S. THANKS JIM FOR THE EFFORT YOU PUT INTO CREATING A WHOLESOME SHOW FOR THE CHILDREN. WE RECOMMEND JIM FOR YOUR CHILDS SHOW. TY so much Andy and Debbie Rigdon. I enjoyed the fun I had with your grandson Anthony and the other kids at the party in Brevard, NC. Thanks for your compliments / kind words. Our neighborhood has 430 homes and is quite active throughout the year with activities. I am head of the Social Committee and take the role seriously and look for only the best for our events. I am pleased so say, I have found the best in Jim! He entertained children and adults alike for 2 hours, twisting non-stop, telling stories, singing songs for a giggle, making everyone laugh then running back in line for more! We had children BEGGING me to bring him back. And I will! Jim was accommodating, generous and the absolute professional! Look no more! He will make your special occasion a memory for a lifetime! of my clients if you wish to speak with them directly. Loved having Jim entertain us! 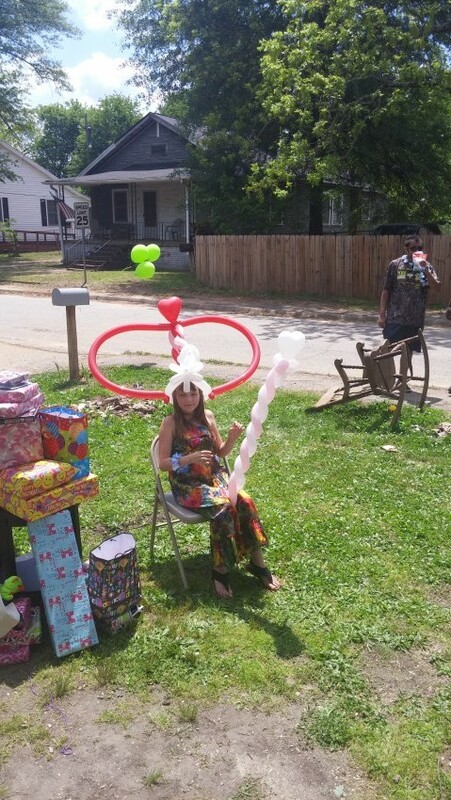 I wanted a balloon artist for my daughters birthday. I hired Jim the balloon guy. He has more great reviews than any one else within 50 miles of Greenville. TY Mrs. Baker! .... About a month after doing the above birthday I got another call from this client asking me to come and entertain at one of her children's birthdays. We booked another date in JULY and I had a great time again and I have been told they want me for her next childs birthday in October ... LOL Thanks again Mrs. Baker! Enjoyed Nicoles Birthday. These ladies laugh/giggle like kids! Its people like you/girls that make what I do so enjoyable. Great to have been of service in Clemson, SC. TY Mrs. Bittan! Our daughter's 4th birthday was so great! Jim entertained everyone with magic tricks, jokes and balloons! Everyone loved his show and we had a great time. He was on time and did so much. More than we expected!! A special thank you for giving our daughter so much extra attention and for making an extra balloon for a child when his broke. You made our party so much fun and we truly appreciate it. Best of luck in South Carolina!!!! Appreciation is one of the best things in life. Loved your party. Thank you Carol Sasser! Jim made my son's 7th birthday memorable! We hired Jim to come to do both magic and balloon twisting for my son's 7th birthday after seeing him at a local event. I am known for always throwing theme parties for my two boys and I usually go beyond the normal birthday party. This year was by far the most enjoyable for the kids thanks to Jim's performance. He had them laughing the entire time, even the adults were joining in! I highly recommend him, my boys are still talking about how funny he was and their favorite tricks that he did. I heard from many of the guests about how much they enjoyed it too. He was very professional, on time, and hilarious! Wow!! nice review. Thanks Katie Thibeault. I'm glad you caught my entertainment at that NH public event and hired me for your childs birthday! Thanks to Jim for coming down to Stratham NH this weekend. It was a combined birthday party for my six year old girl and four year old boy and they'd asked for a circus theme this year. In spite of having to move everything indoors due to the rain, Jim showed up early and stayed late. We had 25-30 kids for his show and he performed with aplomb. The kids laughed and shouted during his magic act and everyone got a balloon animal, especially the two birthday tykes who got huge balloon crowns first and in front of all the other kids. They loved it. Jim the Balloon Guy was greazt for the kids! Went to a birthday party where Jim the Balloon Guy showed off his brand of magic, balloons and humor. The kids loved it (and, quite frankly, the adults did, too!). He was engaging, witty and funny and held the kids' attention during the whole show. Definitely one of the highlights of the party! I am an entertainer myself (in a band) and it was a pleasure to see a fellow entertainer in action. Jim Gordon So glad you, the kids / the adults enjoyed this. Jim The Balloon Guy brought his balloon act to the reunion and the comments were remarkable.Everyone liked his balloon creations. Jim is a balloon artist as well as an excellent entertainer. He made people laugh and enjoy themselves.The various balloon creations he came up with were awesome. Everyone raved about all the various shapes and sizes and variations of balloon creations he came up with. It was very remarkable to see such talent and artistry in front of your eyes.Everyone of any age young or old will enjoy his entertainment and artistry. to have been of service to this all adults event at NHS Class of 1979 Reunion in Rochester, NH ! Jim provided great balloon twisting entertainment for our grand opening event. Kids loved their creations & even some adults took part in the fun. Very timely & efficient. TY! Your NH general store grand opening event was a fun time, I put pics on my website! JZK did an outstanding job entertaining the little ones by making balloon animals and other things. he was very friendly and approachable. When need kids entertainment I will be sure to give him a call. Thanks Tom Colantoni for the nice review. Jim The balloon Guy entertained for Orange Leaf Yogurt in Derry, NH. Great time. Appreciate the laughs I shared that day! Did a great job, entertaining and getting audience participation. Good show for a fun night. Crowd any where from 4 to 95 years old. Everyone had a good time. Thanks Fran Medeiros, I had a great time at this fun event held in Hampstead, NH. I enjoyed this party! Great time @ this NH event!! The kids/adults were so happy & helpful. Sounds like I may be seeing them again in 2014! So cool! Jim the Balloon Guy was a huge hit at our Block Party! We hired Jim the Balloon Guy to come twist balloons for the Neighborhood Block Party at our church last Saturday. 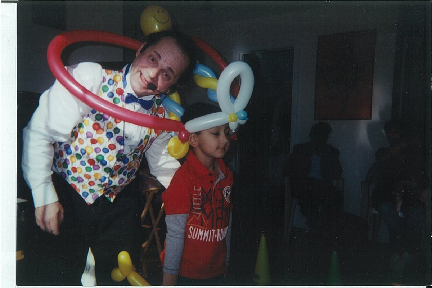 He was a great entertainer and brought many smiles and giggles as he told little stories and jokes to the kids while he made balloon animals. The children (and adults) really responded to him and he drew a crowd throughout the day! He was more reasonably priced than anyone else I contacted. I would definitely recommend him to others! Thanks Sharlene! Really like client, the people were warm & friendly. I was hired back in 2014 and already did event. What a great time! Thanks for nice comments and invite for a 3rd time in 2015. I really enjoyed myself again! JZK Family Shows helped make our event special! The kids all loved all the different balloon twists, and even the adults too. Jim was just what we needed to make the day a hit! TY Briana Duga! Loved this fun Customer Appreciation event for Chiropractor in Maine. We want to thank you for entertaining us at our annual Blue and Gold banquet. Everyone had a wonderful time and laughed until they couldnt laugh any more. Even the adults and older children were impressed with your show. I personally was amazed at how enthralled the kids were during the show.The most skeptical little girl couldn't get all the answers or figure out all your tricks. We are currently planning next years events and want you for our entertainment. Jim, you have a wonderful raport with the kids and you should do well in your business.We will be in touch! Thanks. Your event in Lawrence, MA was a blast. We at Penacook Place had a wonderful time, everyone enjoyed your entertainment.We will pass the word to everyone about JZK Family Shows. Rosa Rivas as you know I had a great time with many seniors as well as some grandkids at your MA event! I'm shocked by this review. At no time did anyone say anything mentioned above to me. This was supposed to be a child's birthday but appeared more of an adult drinking party. You could smell and see most of the adults drinking alcohol. I was at this party in MA and the above is extremely inaccurate in my opinion. I direct those looking for fun family services to my many other reviews and testimonials from happy/delighted clients over a number of years. Jim the magic guy was very funny! The whole family enjoyed him from the children to the adults. He was great entertainment. We'll be calling Jim again in the future!! Thanks Jim!! TY Marissa Scantialago , what a great time at your Boston, MA event! The children were very excited and Jim was able to keep them all intrigued. Jim The Balloon Guy! Thank You Jim! TY I really enjoyed your fun NH birthday party! A very good time with Jim the Balloon Guy! We had Jim come out to help us with our Grand Opening this past weekend in Portsmouth, and we had a lot of fun! He made fantastic balloons, and was good with the kids and the adults. Would be great for birthday parties or kids nights! Wish we had seen some of his other talents! Colby Baker is manager at Orange Leaf Frozen Yogurt in beautiful Portsmouth, NH. The staff were so happy and patrons were great! Jim makes the shows entertaining and interactive. We hired Jim for the first year birthday party of my daughter. He did really nice magic show and kept all the kids involved equally. The kids went crazy went the ballon art. It was a great experience to work with Jim. Event was actually held in an Indian restaurant in Kittery,Maine. A pleasure to have been of service. I'm glad they enjoyed it. Thank you Alli Jaorawala! Birthday Magic with Balloons and a smile. We could not be happier with the event. Jim put on a terrific show for 30 plus kids of mixed ages at our three year old daughters Princess Party. From start to finish he was great. He captured the undivided attention of the kids (as well as a good number of the adults) with his humor and showmanship. Jim was funny and engaging throughout the act and beyond. He continued with his jokes an bag of tricks with the kids as he was cleaning up. We look forward to having him return for our 5 year olds birthday this winter ( as she has already made the request). We highly recommend Jim for his creative and engaging act and his professionalism from the very first phone call. These people from NH were awesome and WOW did they show it! In Feb 2013 I was hired again & had a 2nd wonderful time! The kids were excited, I got hugs and I love yous from some of them. The hosts treat you like family and were extremely happy/complimentative having obtained my services again. Wonderful folks....The Dales! Thank you very much Jim.We greatly appreciate your coming to our event. The children really enjoyed your magic show. TY Dave! Had a great time at your annual blue and gold banquet in Farmington, NH. JZK Family Shows was fantastic. Jim was wonderful, the children were laughing, giggling, and jumping up and down, he involved the kids especially the birthday girl in many of the magic tricks. He has an instant rapport with the audience, and the adults loved it as well as the kids. Highly recommended. Thanks Sheri Hanock, this is one NH birthday party I wont forget anytime soon. I recently attended the Chester Fair. I lived in this town for 14 years and like to visit/attend the events.There was a very energetic,funny and personable man walking around the ball field. He was really encouraging interaction from the kids and adults while he performed many silly magic tricks. 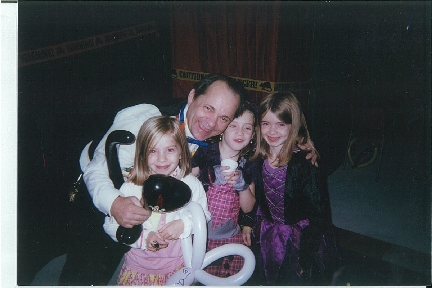 Jim the magic guy had most of us laughing along with him! He captivated and amused those in the audience and later brought many smiles to the faces of people waiting in line when he twisted balloon creations at his tent.Jim made alot of funny comments about the balloons he was making. He was well received by everyone.Hats off to whoever hired this fun entertainer for the fair. Great job! Thanks Mary Marcotte for emailing me review & also coming here & posting it. People like you make my "job" so much fun! I was going to leave halfway through the show and leave someone else in charge but I was enjoying your magic presentation so I stayed till the end. It was really a funny program.Good luck to you and Thanks for a great show! My kids attended at birthday party with Jim the Balloon Guy. They had so much fun and came home with a lot of balloons. Have done lots of American legions,Amvets and VFWS over 22 years. Had a great time at these events. These men have given their time & lives to protect those back in USA. God Bless Our Vets!! Thank You Bob Ventullo, it was an Honor to have been of service to VFW post 8546 in Salem,NH! I hired Jim to do the balloon twisting at my grand reopening event. Jim did an AWESOME job. He was great with the kids and adults, and they enjoyed him a great deal. There were lots of smiles when people were with him and after they left him. He made some amazing animals and hats. Jim was professional and polite when handling the business side of the booking. I would recommend Jim to everyone. If you have a personal or corporate booking he is the balloon twister to hire. Thank you again Jim for the great day, and the special last minute balloon you made as you were leaving for the boy, who's brother popped his balloon. Manager Paula Cayer, Thanks for your nice review. A true pleasure servicing your Manchester, NH Rite Aid #10278 store! I have seen Jim perform at several events. He does great kids' magic and also several balloon creations, animals, hats, etc. The kids always seem engaged. He uses kids as assistants in his magic and they all appear to enjoy being chosen. His lines for animals are long but patient. TY Beth Booth from NH! Jim helped us entertain 40+ kids during our open house this past week. He was professional, courteous and the kids enjoyed the show. We would recommend him without any hesitation. TY! Costa Sideridis ....I Loved your MA factory event! I was the coordinator of our annual Open House. Jim was busy with a long line during the time he was with us. I noticed that the children were excited and appeared very happy with their balloon creations received from Jim The Balloon Guy. kindly at all times. The one thing Jim did not do was to take time out say 20 minutes to eat and drink which I've since suggested he do the next time he joins us. I would definately hire Jim again for another Open House. Had a great time. TY D. Scafidi ! Really enjoyed working for Salem NH Fire Dept. 's Open House. Jim performed for the first time at the Acton Fair (ME) in 2007.
performing balloon shows with The Locke Family at events in Newengland. I recommend his comedy magic show as well. He is also a fun walkaround and meet and greet performer. We ask back the acts that have been requested again & again. Jim continues to be brought back yearly due to popular demand. This talented kid show entertainer engages our crowds and his sillyness & love for his audience comes across through fun, interactive Balloon Shows. We just finished up the 2011 edition of the Acton Fair and once again Jim The Balloon Guy delighted and brought lots of laughs to his Audience. The younger kids are crazy about him for his sillyness / cool balloons and funny patter. Invite Jim's balloon, comedy magic shows or strolling entertainment and watch your attendees be amused! Make your next event .....memorable..... Hire JZK Family Shows. Once again Jim The Balloon Guy has been hired to perform at the Acton Fair. For the first time he will appear for 2 days instead of all 4 days,due to budget cuts. SEE YOU the last weekend of August 2013. Jim did a wonderful job at our church festival. St Theresa's Festival Committee has hired Jim two years in a row. We found him to be reliable, fun and very good with the children. We would hire him again. The kids love the balloon animals and he fits in with all the other activities going on around him. TY Mary Camilleri! I so enjoyed the 2 years I've entertained for your Billerica, MA event. I am so looking forward to your event in 2012 as you asked me to pencil you in for next year. I have had jzk family shows come to my house a total of 3 times in the last two years. Jim did a great job each time he was with us and has got compliments from my guests. He always arrives early and is both professional and a pleasure to work with. done they dont want him to leave. Before I go any further I want to mention that the pricing was the most affordable I found after receiving many quotes from others. With this company I got both a good rate and great service. After Jim did my daughter Angel's 5th and 6th birthday there was no doubt as to who I wanted for my younger daughters 4th birthday party! I had Jim come for the 3rd time this past weekend. balloon hats for some of the adults. We really enjoyed ourselves. I highly recommend this talented entertainer! TY Miss D. Schilling!! What a great time we all had in Hampstead, NH. Jim was a huge hit with the crowd! I brought my 2 grand children to an event open house at Target Plaza in Salem,NH. The program featured live baby chicks, the easter bunny and balloon sculptures. The entertainment that got the most reaction from the crowd was Jim the balloon guy. This man engaged both the children / adults and got alot of laughs from everyone!! His balloon sculptures & funny banter was a huge hit with the crowd that filled the store. I noticed alot of people asking for his card. With the summer already here I bet Jim is going to be really busy! Thanks Dan Mannion! This event was in Salem, NH. I recently had a birthday party for my 10 year old son, and I hired Jim to do balloon twisting. He showed up promptly, set up his equipment, and began his show. It was a different type of balloon twisting experience because he made a guessing game out of the shapes. He was telling jokes and really got the kids interested. As a special touch, he brought my son a birthday card and two mylar "Happy Birthday" balloons. I would highly recommend to hire him for an event. TY Michelle Sabbia! Your party in Reading, MA was a blast! I attended a party recently where Jim performed. The young children were glued to their seats and Jim had everyone laughing, he is very funny. I would highly recommend Jim thr balloon guy!!!! TY Cheryl T! I enjoyed seeing you and all the others at this fun party in MA. Thanks Michelle Normandie! This Lowell, MA party featured Jim The Magic Guy, w/ a comedy magic show & balloon twisting. Birthday girl soon wanted to do magic after seeing the other kids do it. She was funny & adorable & had us all laughing. She tied a shoe magically without touching it. The look on her face was amazing! We hired Jim for our son's 4 yr old bday party. Jim did a great job of adapting the majic tricks specifically for the 4 yr olds. He got everyone involved with his tricks and his silly ways were loved by the kids. He also took his time to be sure all the children had a ballon animal before he left. The 30 min majic act was just enough not too long and not too short for the kids' attention spans. He was prompt and organized. TY Jenn B for a great time at your NH child's birthday! The Billerica Yankee Doodle Homecoming is a yearly community event.It would not be possible without volunteers and sponsors.There is always a large crowd of attendees and lots of food and a variety of offerings. Entertainment included Bands, Magic shows,Balloon Sculpturing & more. entertained the crowds on Saturday and Sunday. He was recommended by another Billerica group. Jim got lots of laughs from both kids and adults including myself. Everyone loved the balloons he created. I recommend JZK Family Shows for any family friendly event! TY SO MUCH! I really enjoyed this multiple day event in Massachusetts. TY! Party took place in Danville, NH. but was hired by a woman in another town. It included magic/balloons. Holiday Characters are WANTED too for the fun and sillyness they create everywhere they go! The Easter Bunny (This lop eared bunny is NOT your see them everywhere BIG HEAD bunny .... No way.... This one has a painted face and he talks to the kids and can twist balloons if hired to do so. You probably have not seen a bunny like this one. The above entertainers are to be considered extremely silly & all measures to protect your funny bones should be adheared to.. Unless u Love to Laugh!! Compare my rates to other quality performers. You will be surprised! As of 2009, I no longer use live animals in my shows.unfortunately I live in a place that doesn't allow animals. VERY IMPORTANT: Bookings: I love my clients. I speak with many prospective clients. A lot of times I am speaking with more than ONE person on the same day and both may want the SAME time frame and date. Just because you spoke with me and said you want to book me does not Guarantee your BOOKING. In order to know you have been "Officially Booked"..... # 1) I Must have a non refundable booking fee in my hand at least 7 -14 days prior to the date of service. ..... #2) I will then email you an agreement or note telling you we are Confirmed and Officially Booked. Sending the booking fee does NOT guarantee that I will appear at your event. I must receive that fee prior to your event and then email you an agreement or note accepting/confirming your event. In the case of two booking fees arriving for the same date and time frame, the first to arrive will secure a particular time frame and date. The other fee will be sent back to the prospective client provided a complete return address is given. VERY Important: I don't have a computer in my home and I don't have everyday access to one. If you leave a message on Friday I might not be able to answer till Monday or Tuesday. If you cant book me as I took another job, I'm sorry for any inconvienince but I can't be in multiple places at the same time. He is one of 3 original founding members Of HAPS ALLEY (WCA) Haverhill, MA. Jim is a past secretary of pounds of clowns alley of NH. A Graduate of P.O.T.M. Clown School and M.C.A.T. University (performance art schools) Memberships include: World Clown Assoc, Clowns Of America Internat'l, International Magicians Society, Fellowship Of Christian Magicians and the "International Association Of Family Entertainment Professionals"
In addition to the many types of events Jim performs at annually, He does alot of Children's Birthdays and you can be sure that the birthday child is the "Star of the Day" especially if they help physically with the magic show which is always encouraged. jim does however let them choose if they wish to participate as all kids are different and some may wish to paticipate from their seats and allow the other kids to help in the performance area which is entirely up to them. Some venue types include schools,libraries,trade shows,(link hidden)rties,corporate events,fairs,family reunions,floor shows,ceiling shows,festivals,recreation depts,alien abductions,IRS audits and most any events where families congregate! Private Life: Jim is widowed from his wife, and also from his fiancee Mary. Jim is an ordained christian minister (Dec. 31,1984) but is not registered with any state at this time to perform weddings. If this changes I will keep you posted. He has 2 children. 1 boy and a girl and several grand kids, the oldest a girl, is in her teen years. The kids live in different states. Hopefully I wont be a great grand pa any time soon hahaha. The following are some quotes from famous people ................. Love these!! Thank You for coming to this site. Let me leave you with something to ponder! "Each day is new. This day has never been & will never be again. Make each day as special as you can for you and your loved ones. Fill your days with alot of life and living! Soon all the treasures that were meant to be yours, Will Be" Have a truly magical and exciting life. You deserve it!! WARNING: CHOKING HAZARD- Kids under 8 years can choke or suffocate on un-inflated or broken balloons. Adult Supervision Required. Keep un-inflated balloons from children. Discard broken balloons at once. "Please make sure at least TWO persons at your party are watching the kids at all times. Jim is an entertainer and NOT a disciplinarian nor a baby sitter. Children are the greatest gift we will ever receive in our life time." Centers in NH & Much More! I had 16 yrs with the Reading police Dept. in MA. doing their childrens xmas party. any change at all..) same entertainer. and have much experience doing this. price for as long as we can. Need another kind of family entertainment? escape artists,circus acts,jugglers and much more! Some of these acts can not be found on the internet for example. 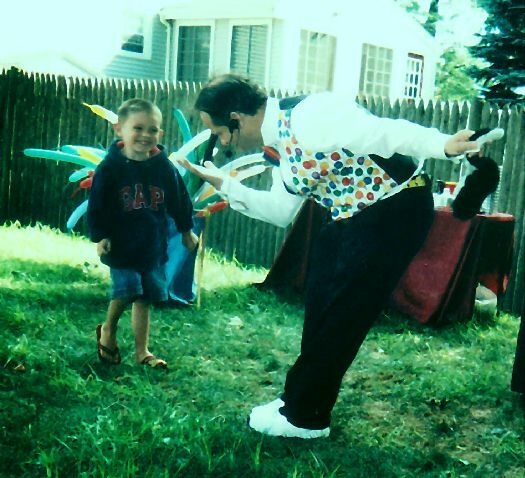 Best Friend-Ken Sherburne world renowned Juggler/Unicyclist/Clown 50 yrs performer.. You are missed ALOT Ken! me at that time. Lucille Ball and Jerry Lewis the king and queen of comedy you were the greatest!! Thanks to anyone that shared their knowledge w/me!